Some days are just made to cuddle up with some hot chocolate and a good book. But, for those of us who are watching calories (what with the New Year and all), hot chocolate may not be the best idea. 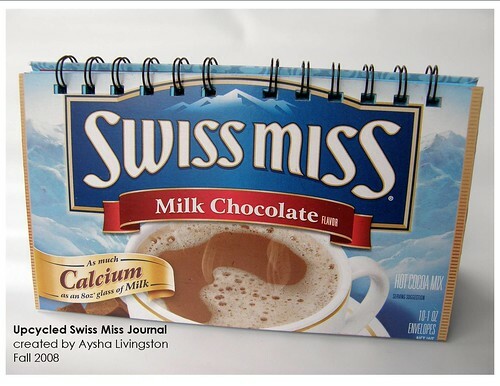 Here is a journal that I created from a Swiss Miss box that combines both the chocolate and the book, minus all of the calories. This journal could be used to record chocolate dessert recipes, or yummy secrets. I think upcyled projects like this will be added into my regular rotation, they are fun and easy to make. Plus they are GREEN friendly. How cute is this?!! Since I’m doing a 365 project this year, I need something to jot down my daily journaling. This would be perfect! Thanks for the inspiration, Girl!